The Stochastic Momentum Index (SMI) indicator was developed by William Blau and is based on the Stochastic indicator. The Stochastic oscillator is calculated using the close price relative to the high low trading range, whereas the Stochastic Momentum Index indicator is calculated using the close price relative to the midpoint of the high low trading range. The oscillator values fluctuate between -100 and 100, and as such the indicator can be readily used to identify overbought and oversold levels. Readings above +40 occur when the market is trading near the top of its recent price range. Readings below -40 occur when the market is trading near the bottom of its recent price range. There are a variety of ways to interpret the indicator, depending on the overriding market conditions or trend. In a non-trending sideways-moving range bound market, the market is considered overbought if the Stochastic Momentum Index reading is above +40; and oversold if it is below -40. The indicator can remain above +40 and below -40 for extended periods of time, therefore it is generally suggested to wait for the Stochastic Momentum Index to reverse before making a trade. A buy signal is generated if the Stochastic Momentum Index indicator moves up out of the oversold zone, crossing back above -40. 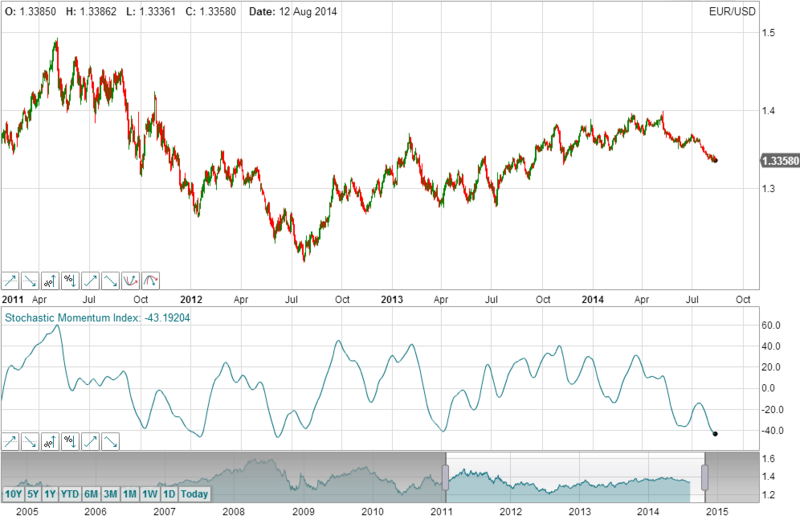 A sell signal is generated when the stochastic moves down out of the overbought zone, falling back below +40. In a trending market that is consistently making higher highs (or lower lows), Stochastic Momentum Index readings above +40 (or below -40) are to be expected. A move above +40 followed by a reversal is not necessarily a sell signal if the trend is bullish. By the same token, a move below -40 followed by a reversal is not necessarily a buy signal if the overall trend is bearish. When using the Stochastic Momentum Index, it is therefore important to determine the overall trend and trade in the direction of that trend. Ignore bearish overbought readings in an up-trending market. Ignore bullish oversold readings in a downward trending market. Another method for trading the Stochastic Momentum Index is to use a signal line, which is typically a 3 period Simple Moving Average of Stochastic Momentum Index. The Stochastic Momentum Index crossing its Moving Average is interpreted as a buy signal; whereas if the Stochastic Momentum Index falls below its Moving Average, it is interpreted as a sell signal. Crossovers which occur above +40 (in the overbought zone) or below the -40 (in the oversold zone) tend to be more reliable signals than those occurring between the -40 to +40 levels. A third method of using the indicator is to trade price / Stochastic Momentum Index divergences - this is where the trend of the market’s price does not agree with the trend of the Stochastic Momentum Index and provides an indication that the current trend may be near ending. This method works on the assumption that when a divergence occurs between an indicator and price, the price generally changes direction to confirm the trend shown by the indicator. Remember, the Stochastic Momentum Index is a momentum indicator. Where price is in an upward trend and making new highs but the Stochastic Momentum Index is failing to make new highs, this implies the price is running out of momentum and a price reversal is due. In such a situation, the Stochastic Momentum Index falling below 0 would provide confirmation of the reversal and act as a sell signal. When the price is in a downward trend (making new lows) but the stochastic forms a higher low, this implies that upside momentum is increasing and a price reversal is due. In such a situation, the stochastic rising above 0 would provide confirmation of the reversal and act as a buy signal. 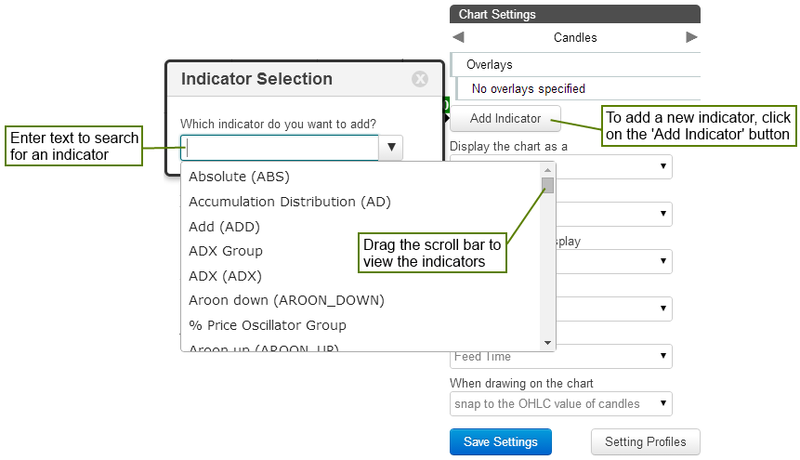 After adding the Stochastic Momentum Index indicator, within the chart settings, click on it to set the parameters and change colours.